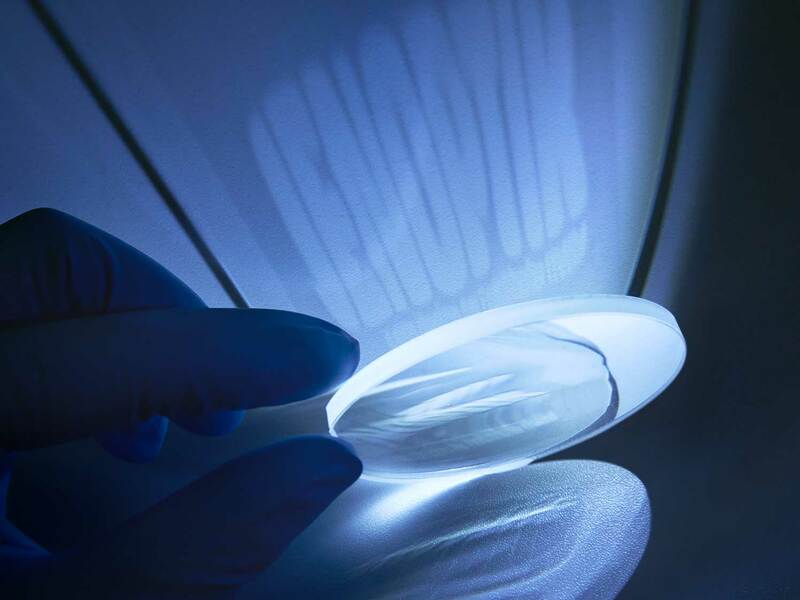 Jenoptik is able to produce polymer optics that are not rotationally symmetrical. These optics are compact and help you to significantly improve your applications. Free-form optics are not rotationally symmetrical and can be used, amongst other things, for the collimation of light, beam formation, imaging and complex light diffusion. For example, a free-form lens can combine and shape parallel light rays to project a logo on one image plane. The optics have asymmetric characteristics. To ensure accurate processing of these optics with ultra-precise lathes, special knowledge is required along the entire process chain. Jenoptik has the required expertise and sees free-form optics projects from the design stage through to system integration. With our Slow Tool Servo technology, we can produce high-precision free-form optics with diameters ranging from 1 to 350 mm. We use a modified diamond turning procedure, which uses a controlled rotation axis as well as two linear axes. The part of the free-form optics that is not rotationally symmetrical is achieved by means of a dynamic movement of the tool toward the optical axis. The process is ideal for diamond processing of polymers (PMMA, Zeonex, PC, PS) and metals (nickel-phosphor, aluminum, copper, brass). Depending on your particular application, we can produce the free-form optics in a wide range of shapes.